A historian of bread on the history of bread "There is no good, no bad, only bread"
In matters of personal taste there are no absolutes. I like this, you like that. But does that also mean that there is no good, no bad? That is a surprisingly complex question, especially when it comes to as fundamental a food as bread. William Rubel is a freelance historian of food who seems to take a delight in pricking the pretensions of people like me, who think that some kinds of bread are better than others. “Why can’t we like what we like?” he asked in a defence of supermarket packaged bread. To which I say, “Like it if you like, but don’t tell me it is good.” He also says that there is no historical tradition of using a leaven among Anglophone bakers, which somehow diminishes the efforts of English-speaking bakers to “revive” the use of sourdough leavens and long fermentation. And that revival denigrates supermarket bread. Well, yes. At least as far as my own tastes go. 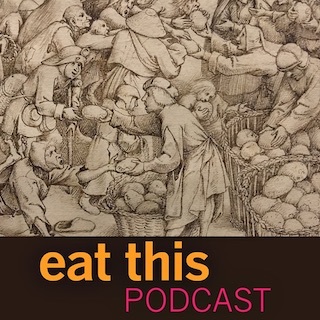 But I wanted to understand this historian’s view of bread, and was glad that William Rubel accepted my invitation to be a guest on the podcast. On my own website – this one, right here – I was more than happy to explain Why I don’t like the Chorleywood Bread Process. Searching for information on the world’s biggest baker, I was very pleased to learn that Bimbo has replaced hardtack at least for some sailors. The banner photo of Bimbo bread is by Oatsy40 on Flickr. So, J, are you going to grind fresh flour for my focaccia? I’d love to taste the difference between that loaf and the old standby of 45 or 9/10 protein lousy flour that makes such a good focaccia and pizza. However, the ball of dough I put away each Sunday (pizza night) that rests in the fridge for a week, sour-ing, is really the start of killer pizza dough. We’ll have to try this out one day. I have yet to get a mill, and that’s because I have yet to find reliable sources of wheat seeds that interest me. I know others are doing it, but I am always behind the curve. @hotscotchoven Not at all. I really wanted a better understanding, and I think I got it. @1000bitesofbread I’ll be interested in your take on it. Michael Gillespie liked this article on instagram.com. Emlyn Flanigan liked this article on instagram.com. Linda M liked this article on instagram.com. Svilen Klasanov liked this article on instagram.com. Rob VanKeuren liked this article on instagram.com. Matthew Dillon liked this article on instagram.com. Barry Pitcher liked this article on twitter.com. William Pettit liked this article on instagram.com. tim liked this article on instagram.com. Emily Salkeld & Chris Duffy liked this article on instagram.com. Aleja liked this article on instagram.com. MESSORS liked this article on instagram.com. 🍷S&B’sWineQuest-just a taste liked this article on instagram.com. Karin Vaneker liked this article on instagram.com. karimamoyer liked this article on instagram.com. Nicola Davies liked this article on instagram.com. localempa liked this article on instagram.com. Caroline Hennessy liked this article on instagram.com. Heather Lynn Reid liked this article on instagram.com. Leyna Lightman liked this article on instagram.com. Katie Venner liked this article on instagram.com. Mari Lise Stonehouse liked this article on instagram.com. Don Sadowsky liked this article on instagram.com. Susan Schaeffer liked this article on instagram.com. A. Creanza liked this article on instagram.com. Bruce McMichael liked this article on instagram.com. Molly liked this article on instagram.com. 비소무 reposted this article on twitter.com. Claire Spahn liked this article on twitter.com. EarlyMedFoodIreland liked this article on twitter.com. LophiusPat reposted this article on twitter.com. CulinaryArchaeology reposted this article on twitter.com. Jennifer Keenan liked this article on twitter.com. Flicka Small liked this article on twitter.com. Charmaine McFarlane reposted this article on twitter.com. Dr Dorothy Cashman reposted this article on twitter.com. William Rubel doesn't think there is good bread or bad bread, but he knows what he likes.